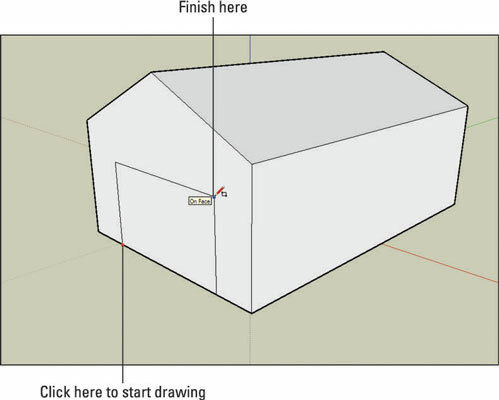 After you have SketchUp set up, you’re ready to make your first quick model. 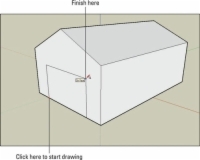 Follow these steps to build a doghouse. On your computer screen you should see a row of tools across the top of your modeling window, a little person, and three colored modeling axes — red, green, and blue lines. 1Delete the little person on your screen. Using the Select tool (the arrow on the far left of your toolbar), click the little person to select her (her name is Sophie, in case that matters to you) and then choose Edit→Delete. 3Draw a rectangle on the ground. Use the Rectangle tool to draw a rectangle by doing the following: Click once to place one corner on the left side of your screen. Click again to place the opposite corner on the right side of your screen. Remember that you’re in a 3D perspective, or view of the world, so your rectangle looks more like a diamond — 90-degree angles don’t look like 90-degree angles in perspective. It’s important to draw the right kind of rectangle for this example (or for any model you’re trying to create in Perspective view), so try it a few times until it looks like the rectangle shown. To go back a step, choose Edit→Undo Rectangle; the last thing you did is undone. You can use Undo to go back as many steps as you like. 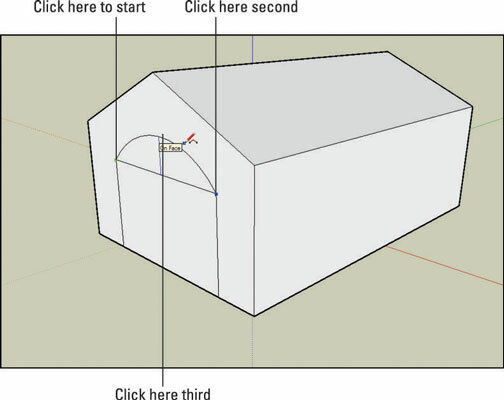 4Use the Push/Pull tool to extrude your rectangle into a box. Click the rectangle once to start the push/pull operation. Click again, somewhere above your rectangle, to stop pushing/pulling. 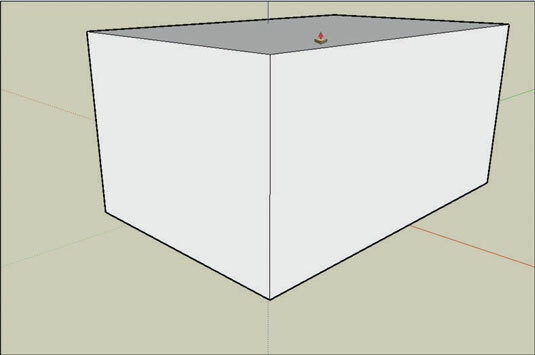 At this point, your model should look like the one shown; if it doesn’t, use Push/Pull again to make your box look about the right height. If you’re happily pushing/pulling away on your box and everything suddenly disappears, you pushed/pulled the top of your box all the way to the ground. Just choose Edit→Undo and keep going. 5Draw a couple diagonal lines for your roof. Click once at the midpoint of the top of your box’s front face to start your line. You know you’re at the midpoint when you see a small, light blue dot and the word Midpoint appears. Move slowly to make sure that you see it. Click again somewhere along one of the side edges of your box’s front face to end your line. Wait until you see a red On Edge square (just like the Midpoint one in the last step) before you click; if you don’t, your new line won’t end on the edge like it’s supposed to. Repeat the previous two steps to draw a similar but opposite line from the midpoint to the edge on the other side of the face. Don’t worry about making your diagonal lines symmetrical; for the purposes of this exercise, it@’s not important that they are. 6Push/pull the triangles away to leave a sloped roof. 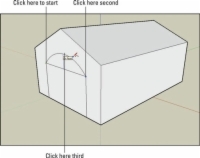 Use the Push/Pull tool (the same one you use in Step 4) to get rid of the triangular parts of your box, leaving you with a sloped roof. Choose Edit→Select None to make sure you don’t have anything selected in your model. If this menu option is grayed out, you’re good to go. Select the Push/Pull tool and then click the right triangular face once to start the push/pull operation. Move your cursor to the right to push the triangle as far as it will go (so that it’s even with the end of your box). Click again (on the triangle) to end the push/pull operation and to make the triangular face disappear. Still using the Push/Pull tool, double-click the left triangular face to repeat the previous push/pull operation, making that face disappear as well. 7Draw a rectangle on your front face. 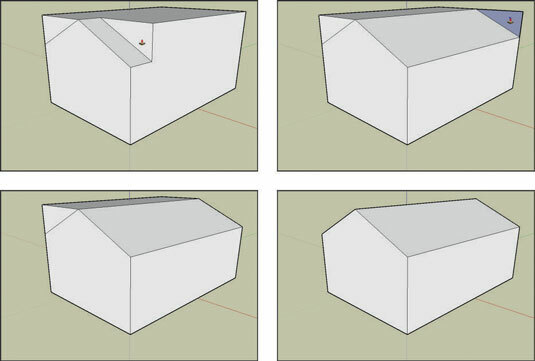 Switch back to the Rectangle tool (which you used in Step 3) and draw a rectangle on the front face of your pointy box. Make sure that the bottom of your rectangle is flush with the bottom of your box by watching for the red On Edge hint to appear before you click. Using the Rectangle tool is a two-step process: You click once to place one corner and again to place the opposite corner. 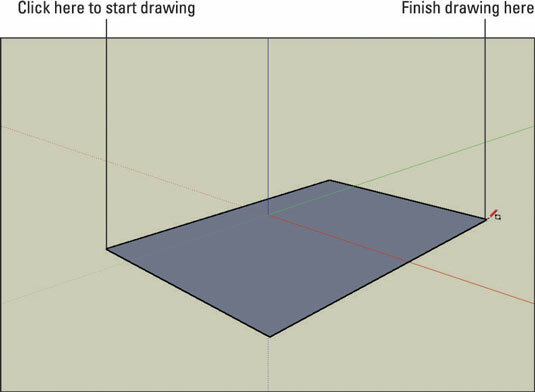 Try not to draw lines and shapes in SketchUp by dragging your cursor; doing so makes things more difficult. Practice clicking once to start an operation, such as drawing a rectangle, and clicking again to stop. 8Draw an arc on top of the rectangle you just drew. Click the upper-left corner of the rectangle to place one endpoint of your arc. Make sure that you see the green Endpoint hint before you click. Click the upper-right corner of the rectangle to place the other endpoint of your arc. Move your cursor up to bow out the line you’re drawing into an arc and then click when you’re happy with how it looks. 9Select the Eraser tool and then click the horizontal line between the rectangle and the arc to erase that line. Push/pull the doorway inward. Use the Push/Pull tool to push in the doorway face you created. Use the Push/Pull tool by clicking a face once to start, moving your cursor to push/pull it in or out, and then clicking again to stop. 10Erase the horizontal line at the bottom of the doorway by clicking it with the Eraser tool. This makes the line (and the whole face above it) disappear.